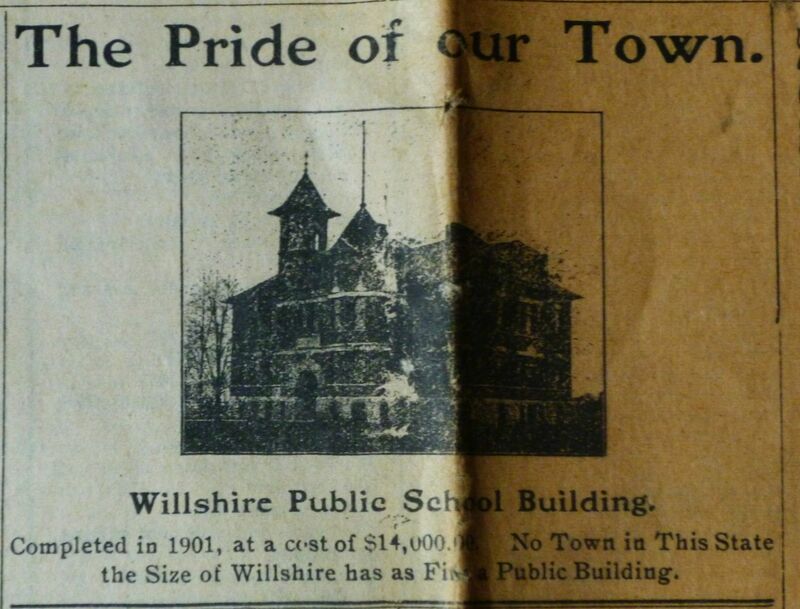 Below is a photo of the front page of the Thursday, May 5th 1904 issue of the Willshire Herald. I found the 8-page newspaper among some Schumm papers and I speculate that my maternal great-grandfather Louis J. Schumm (1851-1938) saved the paper. His son, my grandpa Cornelius, would have only been about 8 years old in 1904 and I doubt that he saved it. 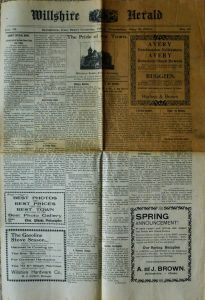 Willshire Herald, 5 May 1904. 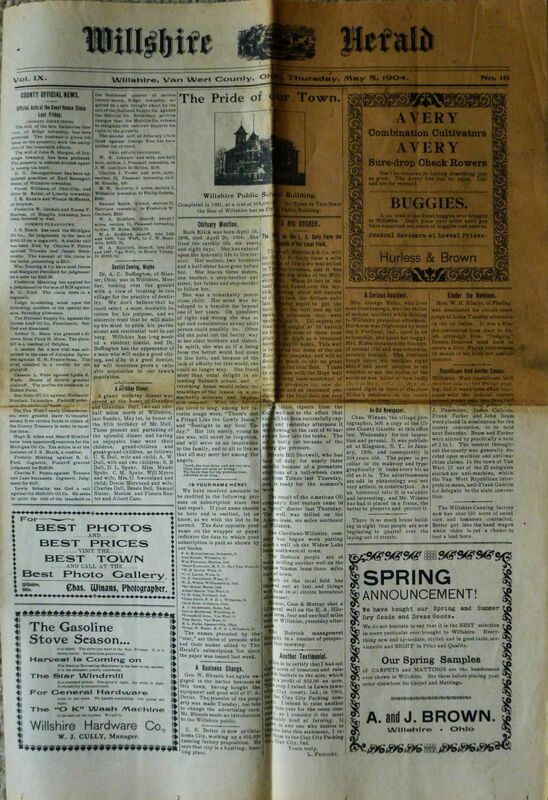 The question is, why did Louis Schumm save this one newspaper? There must have been something important in the paper, but I am not sure what it is. I can only guess. 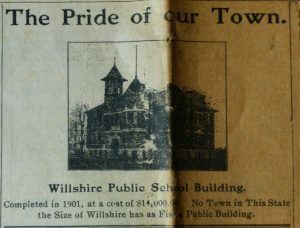 On the front page is a photo of Willshire Public School, ”The Pride of Our Town.” But the school was not recently built at that time. It was completed in 1901. Mrs. George Kuhn, who lives near Chattanooga, was the victim of a serious accident while driving to Willshire yesterday afternoon. Her horse was frightened by meeting a Portland, Ind., sport in an automobile, and upset her buggy. Mrs. Kuhn sustained the fracture of several ribs and was otherwise severely bruised. The Portland tough drove his machine right ahead and never stopped to see whether or not the victim of the accident was killed or how badly she was hurt. The accident occurred right in front of Harrison Miller’s residence at the south approach to town. Willshire West Republicans held another caucus last Friday evening, but it was a tame affair compared with the judicial contest several weeks ago, less than half as many votes being polled. O.J. Passwater, James Chilcote, Frank Forker and John Beam were placed in nomination for the county convention, to be held next Saturday. Beam and Forker were elected by practically a vote of 2 to 1. The contest throughout the county was generally decided upon machine and anti-machine claims. In the town of Van Wert 17 out of the 22 delegates elected are anti-machine, which the Van Wert Republican interprets to mean, anti-Frank Gamble for delegate to the state convention. The will of the late Catharine Gorman, of Ridge township, has been probated. The husband is given life lease on the property, with the exception of the household effects. The will of John H. Morgan, of Jennings township has been probated. The property is ordered divided equally among his heirs. D.X. Baumgardener has been appointed guardian of Earl Baumgardener, of Willshire township. Forest Williams, of Ohio City, and Olive M. Roller, of Liberty township. J.R. Rankin and Winnie McKenzie, of Delphos. Frederick W. Oechsle and Emma F. Hurless, of Hoaglin township. W.S. Johnson and wife, one-half acre, section 5, Pleasant towship to J.W. and Dale McMillen, $150. Charles J. Foster and wife, inlot, section 12, Pleasant township to J. M. Stanley, $20. M.W. McCarty, 3 acres, section 5, Willshire township to Philip Gehres, $200. Samuel Smith, a tract, section 21, Harrison township to Frederick W. Oechsle, $350. …Arthur G. Moon was granted a divorce from Flora H. Moon. The plaintiff is a resident of Delphos. Casseus L. Wade against Lydia R. Wade. Decree of divorce granted plaintiff. The parties are residents of Middle Point. No mention of Schumm relatives thus far. 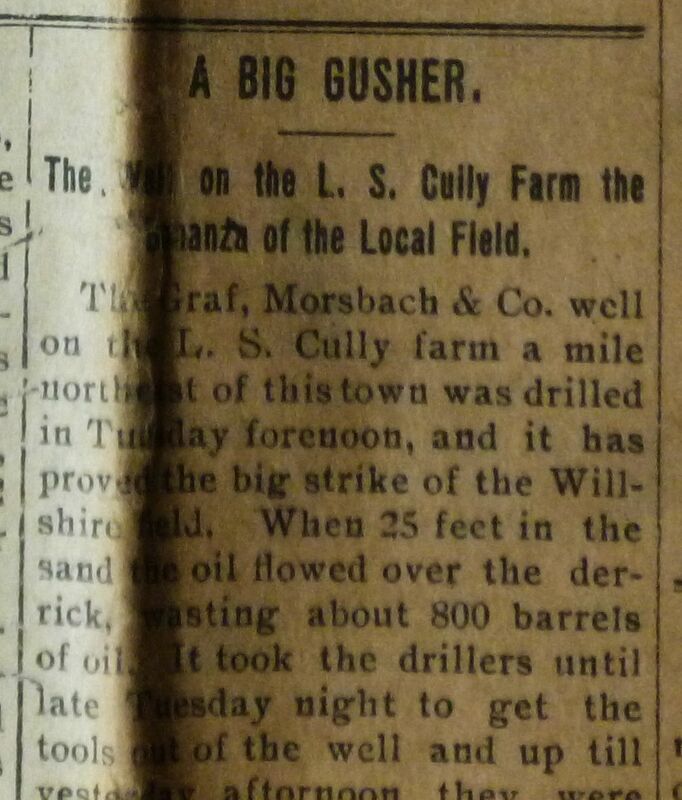 There is a long article about a big oil gusher on the L. S. Cully farm, located a mile northeast of Willshire. It was reported as a “big strike in the Willshire field,” possibly producing up to 1,000 barrels a day. This could be it! This article could be why my great-grandfather saved this newspaper. He lived in the area of that oil well. The article said that new development and increased production in the local field are very promising. The article also mentioned wells on the E.A. Hileman farm, 4 ½ miles east of Willshire; the Hopf well southwest of Willshire; the Adams lease 6 miles southeast of town; the Widow Lake lease, southwest of town; and the Widow Stamm lease 3 miles east of town. There was an oil boom in the area at that time, particularly south of Willshire, near Chatt. My paternal great-grandfather Jacob Miller had several oil wells on his farm north of Chatt at that time. 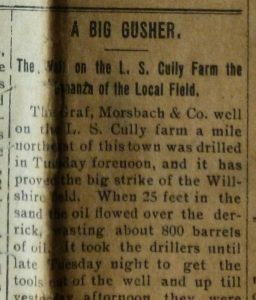 Perhaps my maternal great-grandfather hoped for some drilling on the Schumm farm. For now, my money is on the oil article. Very interesting to find a mention of Forest Williams and Olive Roller taking out a marriage license. Forest was the brother of my grandmother Grace Williams Smith of Ohio City. It is always fun and interesting to see information like this about our ancestors! Thanks for writing!